Today, I think of Beth Moore. If you have never heard or read her story about the hairbrush, it truly is one you should Google. (I will also post it in the FB BGB group). It is an amazing act of bravery. But what I love the most about the story is how incredibly human she was in it. I think so often, we raise people up much higher than they should be. Many times, I have felt people do that to me. We look up to them and he/she seems to have it all together. Wanna know something? No one truly has it all together. We are all walking a road. No one walks their roads perfectly. None, but Jesus. I shared in my last blog about my struggle with fear. Paralyzing fear at times that robbed me of peace. As I read my own words, something hit me… flashes of brave moments throughout my life came pouring through. Girls, I think it is time to stop getting hung up by our human moments. We need to start looking through God glasses and start accepting what He says we are. So many of us can go through this long list of how we are not brave, but being brave doesn’t mean we don’t have fear. We are brave while being afraid and doing “it” anyway. Did you see it? Jesus called Peter out of the boat with the waves crashing around him. Jesus did not calm the sea first. When they climbed back into the boat; that is when the wind died down. Jesus touched my heart saying I am the God who will calm your sea, but I am also the God who will have you step out in your storm. This was a moment that Jesus encouraged my heart to be brave. He may calm your storm or He may call you out of the boat with the waves crashing around you, but regardless, He is always there to catch you. 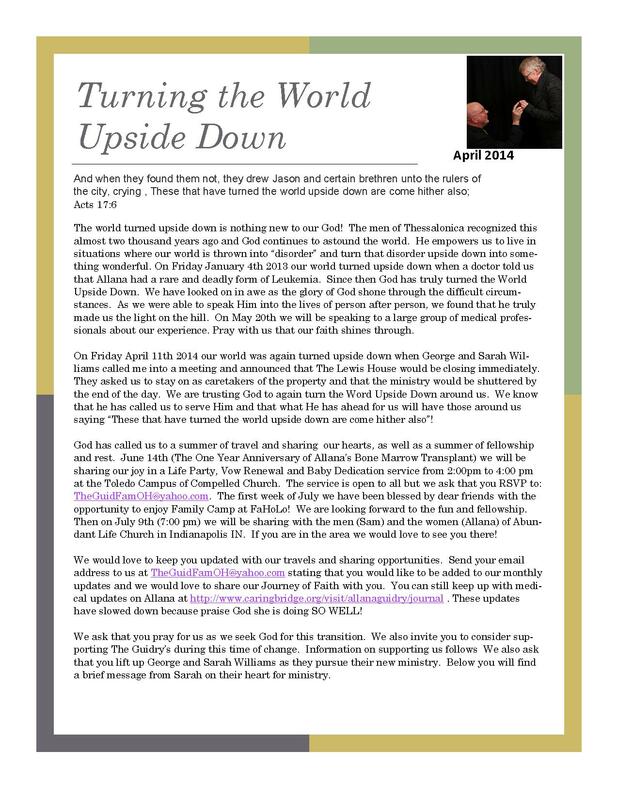 This is our first Newsletter since the closing of The Lewis House. 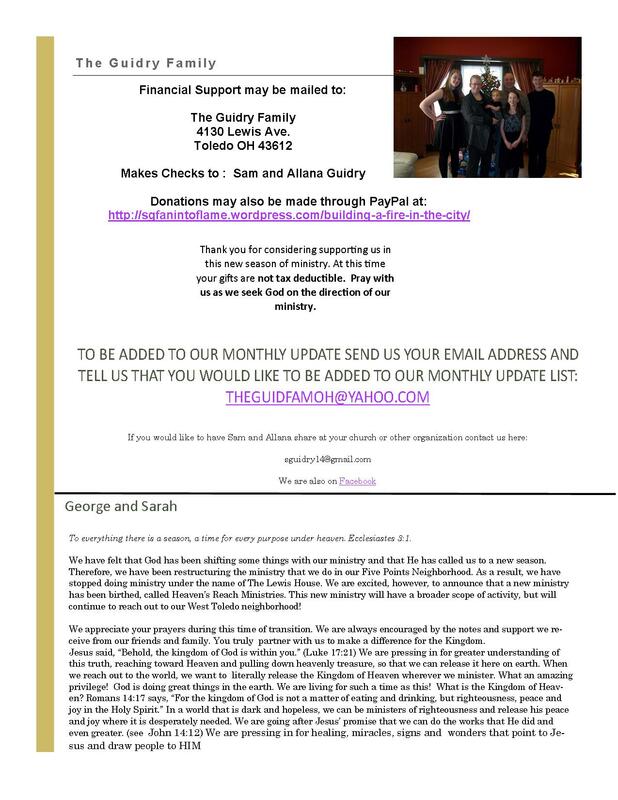 Below is a link to the PDF version with live links for donations and contacts. He also understood the centrality of love to the very existence of God’s children expressing it wonderfully in 1 Corinthians 13. It should be no surprise that we find love at the center of biblical perseverance and that we have perseverance at the heart of biblical love. The salvation story extending from Adam to Jesus to the first century church and beyond is a wonderful statement of this idea. It expresses love without regard to circumstances, appearances or reciprocation. So we have seen that hupomone is not something that we slog through on our own. It is not “super-moaning” as we hold the course through difficult times. It is a gift from God. Biblical perseverance is at its core God allowing to to partake in His divine nature and all that this means. As such it brings with it all of the fruit of the Spirit so that with Paul we can be “content in whatever circumstances” (Philippians 4:11) we find ourselves. It is the overwhelming Love of God that is at the heart of the transformation process that conforms to the nature of Christ and separates us from the nature of the world.